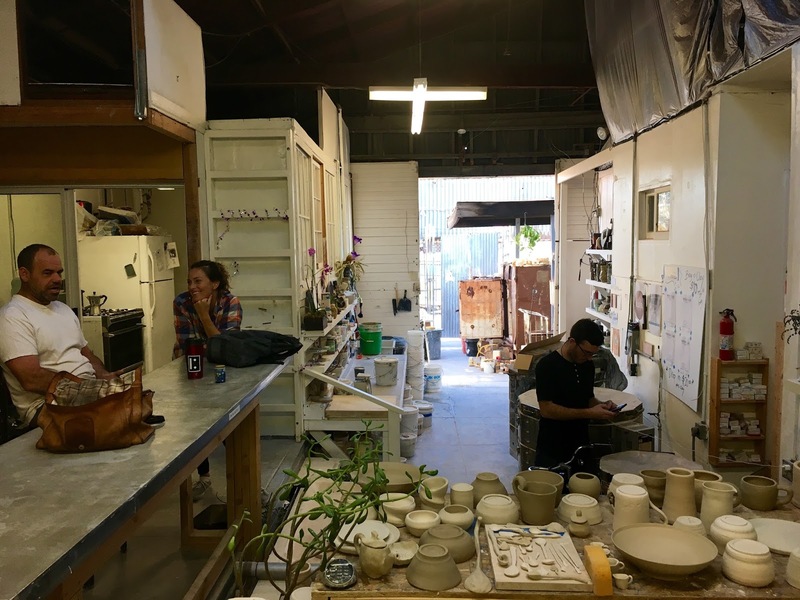 As I've set out to tell stories about awesome classes you can take in Venice, I realized that it's more than all of us learning new things ... it's also about keeping these teachers and artists in Venice by paying them for classes as they face ridiculous rising rents and the threat of a homogenized Venice. Then it creates even MORE artists and people that know how to do cool things, and Venice remains cool. Everybody wins. So today let's talk about ceramics and how you can learn to throw down at the Temple Of Mediclaytion with your teacher, Patrick Johnston. 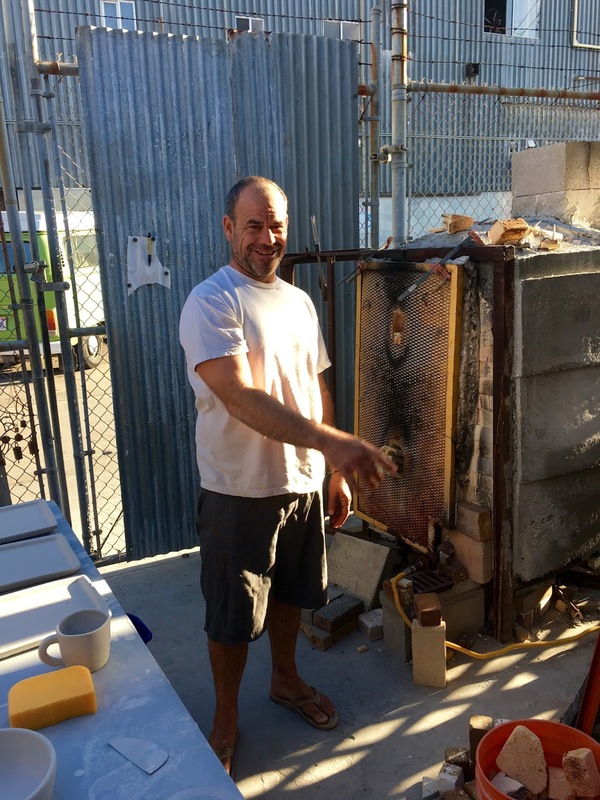 Johnston grew up in Newport Beach, and at the age of 6 in Kindergarten, he had a lightning flash after asking for all the scraps from the old clay hand project that kids do. At recess that day, he realize that ceramics was going to be his thing. 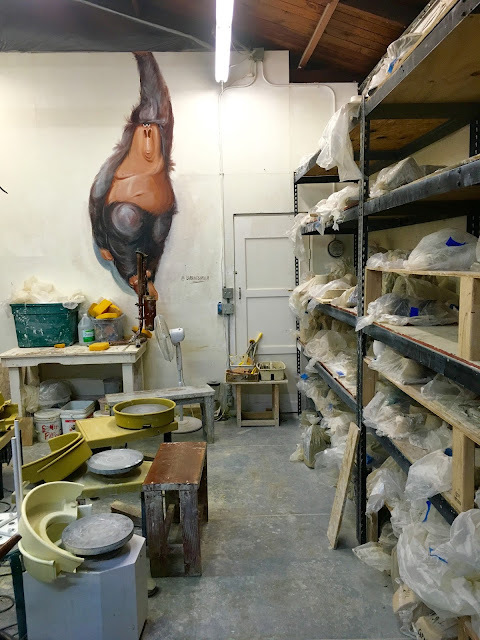 He would beg, borrow, and steal to be able to keep working with clay, fighting to do it because his parents didn't see a big future in it for him. When you have to fight to do something, you tend to do it as much as you can, and Johnston would bury himself in a clay studio for 18 hours a day if he could, especially once he was exposed to the wheel at the age of 11. College took Johnston 14 years to complete, with the first 11 bouncing around to different schools, skipping classes to be in the studio and surf (he definitely comes off more as more of a burly surfer than sensitive clay Zen master, which makes it all the more a testimonial to the calming effect the art has on someone). Once he realized that he should be majoring in ceramics, he got into the prestigious Rhode Island School of Design, and it was all straight A's, graduating top of his class from there. After a stint teaching and running the clay studio at Santa Barbara City College (where he could also surf), Johnston came to Venice kind of by accident. 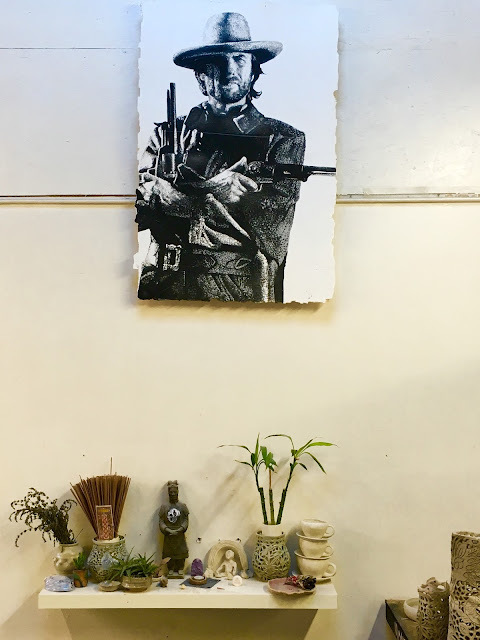 He came down to take care of his ailing father, and a friend offered him studio space in Venice, where he built up an entire community of avid clay artists before settling into the current space for the Temple Of Mediclaytion on 4th Street in the Art Block District in February of last year. "It's therapeutic to throw clay," explains Johnston. "You're touching a grounding material of Earth ... you have to be in the moment, or it will break. There are four stages, with so much that can go wrong, and disaster around every corner, so you learn to be unattached. When you look at the throw lines, you can see where exactly someone's thoughts dropped off. You have to be super focused and present, or it will come back to haunt you ... You have to train your thoughts to not bring in your own b.s. with you, and leave it at the door." Hence - The Temple Of Mediclaytion. Complete with its own altar, featuring both Zen totems and Dirty Harry. Classes are offered Monday through Thursday evenings, with your group meeting once a week for six weeks. 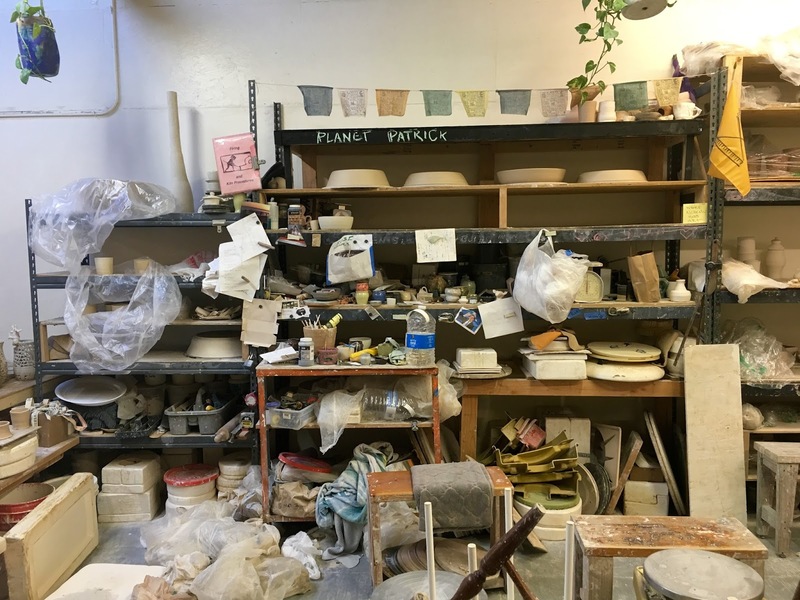 You'll sit and make something pretty, created with your own hands (after wheel/making something, drying, firing, glazing, decorating, and cooling), sure, but you'll also experience a welcoming community of loving and fun people on your same page. 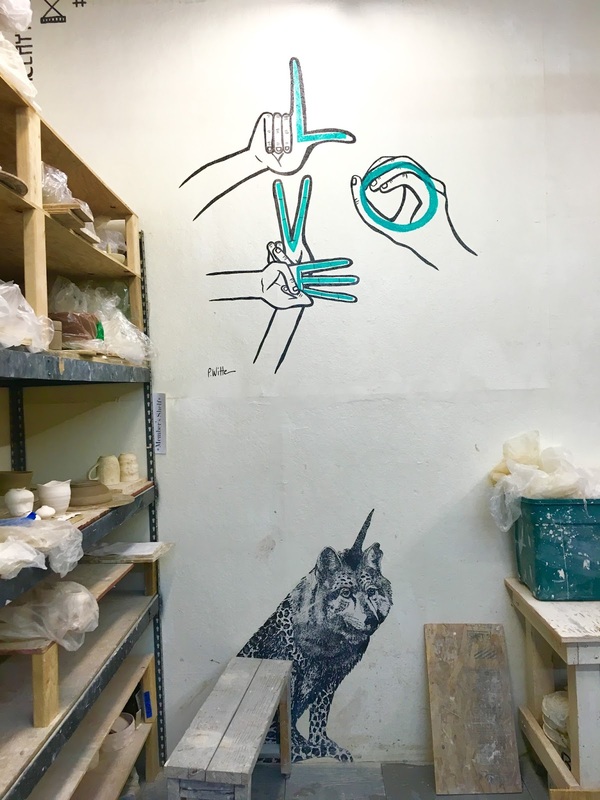 You'll sit and work surrounded by all the works in progress, and walls adorned by fellow Venice students/artists like Priscilla Witte, Diana Garcia, and Isabelle Alfred Lago. One of Johnston's students/"Family members", Kat Carter, was there working on a project while we were talking, and she chimed in, "It attracts good vibes here." "Temple of Mediclaytion feels like a second home for me & that is because of the love that Patrick, Sam and the rest of the team pour into the space. My first class was with Andy and she completely blew me away with her grace on the wheel. 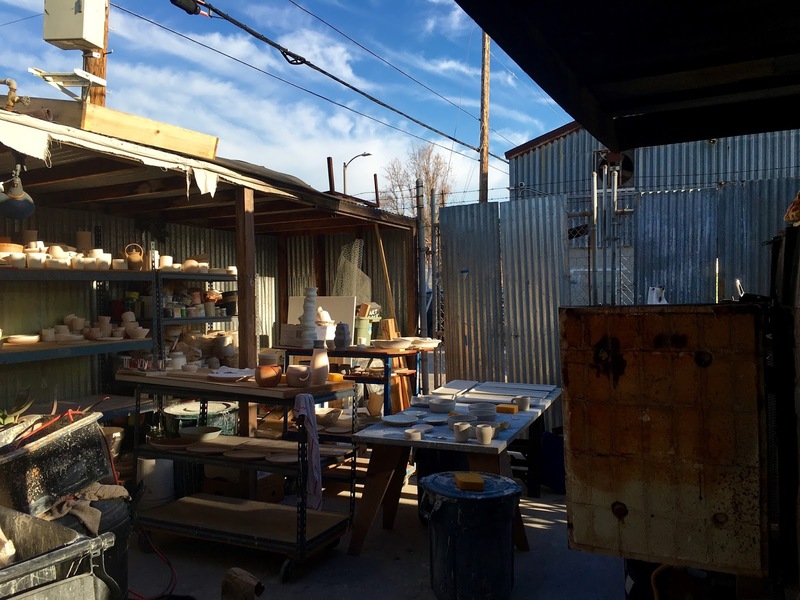 Clay is enigmatic to me, it can take a punch and is the most delicate thing at the same time. It's a meditation on patience for me & I've taken away more gratifying insight about myself from a lopsided bowl or a wonky mug in my hands than any self help or creative endeavor. It's inspiring to see what other students are working on, see their work progress on the shelves. A friend of mine there, way more advanced than I, once took a piece I discarded out of the trash and said, "Don't throw this away..." "It's got a lot of imperfections", I said. His response was, "that's exactly why it's a beautiful piece. 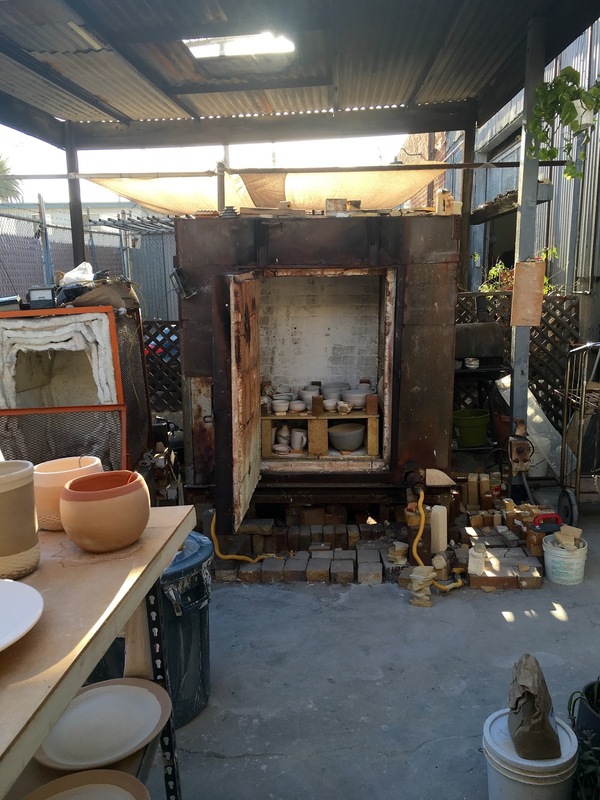 You should glaze it and put it in the kiln." I looked at it again with a different set of eyes & am taking this lesson with me outside of those beloved walls." Everyone can use more good vibes, right? Throw a new skill in for good measure, and you're way ahead of the game. Johnston told me that the symbol for the Temple Of Mediclaytion is an hourglass with no sand in it, because when you're here, you're not really aware of time - like it is whenever you're having the best time. 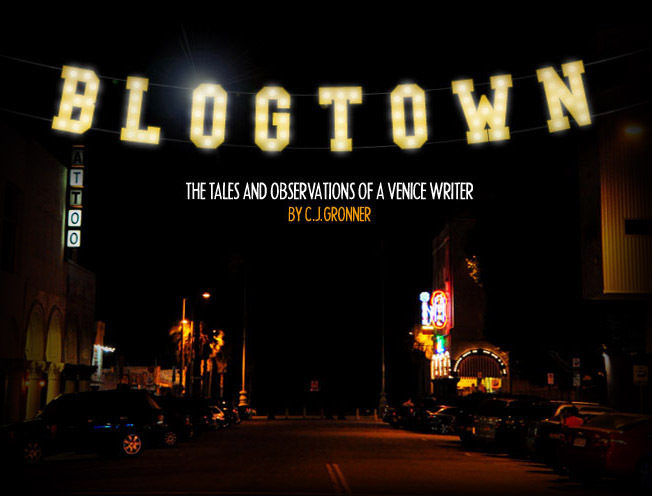 Johnston loves Venice, changes and all. He has created the dishes for places like Gjelina and The (new) Rose Café, and is kept busy with commissions and gallery shows. 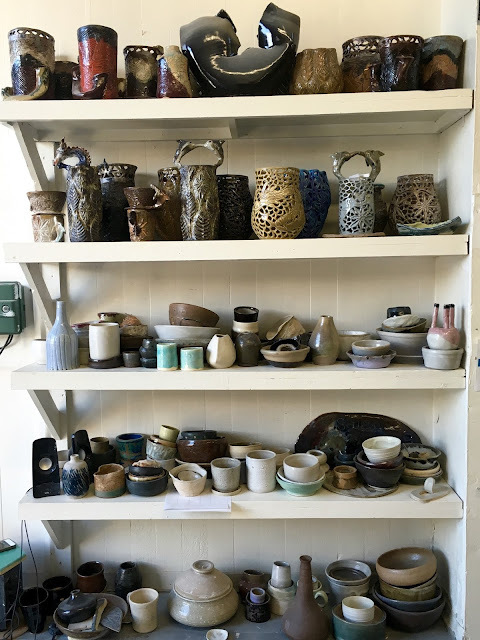 This is all in response to the moment that ceramics is having now, but also, as he put it, "Creatives in Venice need to hustle now to stay in Venice. It's fun, there are a lot of movers and shakers - because they have to be." Johnston had a drawing teacher named Ted Villa that was fond of saying, "Good, better, best, never let it rest, 'til the good gets better, and the better best." Good advice, and good inspiration, as we all go about learning new things, getting better at them, and preserving the artistic integrity of this wonderful, creative vortex we call home. *Class photos courtesy Saori Wall. Beautiful!! I miss it!! :) Love you guys!